Integrating very interesting results from the most important R & D project ever made in Germany, this book offers a basic understanding of tribological systems and the latest developments in reduction of wear and energy consumption by tribological measures. 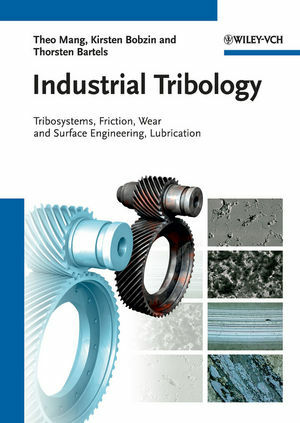 This ready reference and handbook provides an analysis of the most important tribosystems using modern test equipment in laboratories and test fields, the latest results in material selection and wear protection by special coatings and surface engineering, as well as with lubrication and lubricants. This result is a quick introduction for mechanical engineers and laboratory technicians who have to monitor and evaluate lubricants, as well as for plant maintenance personnel, engineers and chemists in the automotive and transportation industries and in all fields of mechanical manufacturing industries, researchers in the field of mechanical engineering, chemistry and material sciences. Theo Mang gained his diploma for mining engineering and his PhD in chemical engineering from the University of Clausthal (Germany). Since 1998 he has been Professor at the Faculty of Mechanical Engineering of the RWTH Aachen. He began working in the field of lubricants at Fuchs in Mannheim, becoming head of the technical department in 1980 and a member of the Executive Board of the global Fuchs Group from 1983 until 2001, responsible for technology and later additionally for group purchasing and human resources. Professor Mang is recipient of the Georg Vogelpohl Medal, highest award of the German Society of Tribology and has 80 publications (books, articles in Encyclopedias and in journals) to his name. Kirsten Bobzin studied mechanical engineering at RWTH Aachen University, where she gained her doctorate in 1999. She then worked as a senior engineer at the Materials Science Institute of RWTH Aachen University, becoming Head of the Surface Engineering Institute in 2005. She won the Borchers Award of RWTH Aachen University in 2000, is and evaluator for the DFG, BMBF, AiF, is board member of the GTS, EFDS, WAW, aec, zmb and WeFo, is member of VDI, GfT, DVS, DIN, DGM, GfKORR, DKG, InPlas, IVAM, ASM, DGBM and has sat on the organizing committees of several international conferences. With over 400 scientific publications in national and international journals to her name, Professor Bobzin's research interests include surface engineering, brazing, tribology, corrosion, and materials science. Thorsten Bartels obtained his Diploma and PhD in Mechanical Engineering from the Ruhr University, Bochum (Germany). His doctoral work focused on machine elements, gears and mechanical design. From 1997 to 2005 he worked for the Fuchs Group, Mannheim, where he was a leader for both internal and inter-company research projects. He was a member of and chaired some DIN, CEC, FVA, FVV and DGMK working groups and is a member of the FVA?s advisory committee. He was the head of the Fuchs Mechanical-Dynamic Test Laboratories, supporting product development, product management and research while consulting and driving the development of new test rigs and test methods for engine oils, hydraulic fluids, gear oils, and greases. In 2005 he moved to Evonik RohMax Additives GmbH, Darmstadt, where he is head of the Performance Test Laboratory, developing new additive technologies, coordinating external research projects, and supporting the Technical Service department and external customers from the oil industry. He has authored many articles in scientific publications.